Just couldn't resist the urge to show on what I'm at the moment working on, since Saloon: The Duels map is nearly finished and doesn't require any more high attention to it mapping wise. This time I got hooked by the Pedo Ciego idea of Skinny Bar. At the moment there's nothing really much to show off, just a sketch of the saloon itself how it could look in-game. Since it will be probably again a rather small map and I'm at the moment with no real ideas of what it should be (what kind of objectives and stuff), I'm again asking to you guys, if you can help me out with some interesting background story (looking @ El Pedo Ciego now), interesting objectives (looking @ Ringo now) and the surrounding area buildings and stuff (looking @ all of you). I had and idea of King of the Hill script/style map. 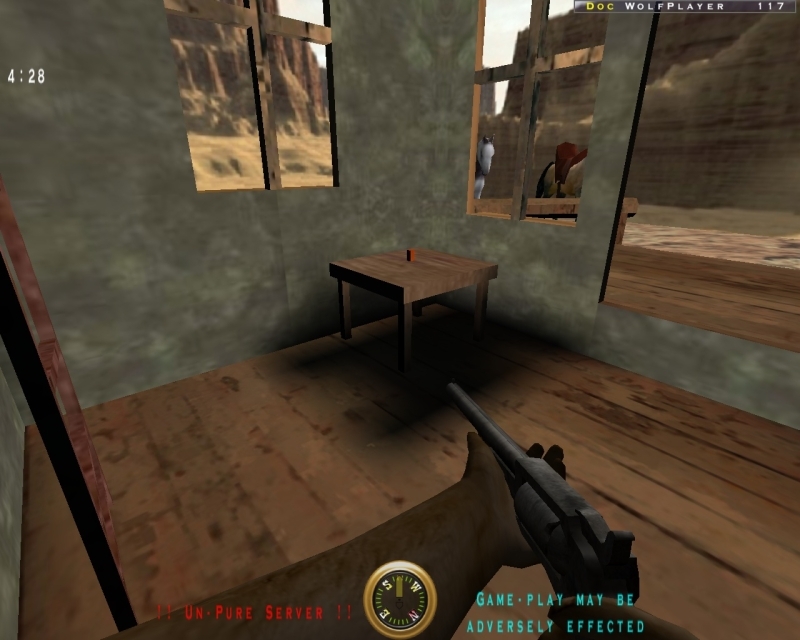 I remember there was a test map for RtCW which offered a single flag pole in center of the map which could be taken by every team (axis or allies), every 5 or 10 seconds it counted in the time how long it's held. The winner was announced then, when one of team held the flag in total for something like two minutes. For this idea already bugging Ringo, since he's a scripting guru now for me! As for two (Bandit and Cowboy) spawn places I'm thinking to make in one side that WC-like small building and in other - something like horse pack. Both respawn places could be made diagonally or something. Don't pay the attention to windows shape and doors for now - they will definitively change to something different. Tomorrow will continue evolving it (any suggestions what can be put inside a Saloon which can hold up to 4 cowboys standing vertically in it? ) and expanding the territory around it. Made my day man. I will try to find more skinny saloon images for you, but in almost all of them, the saloon is situated on the edge of a cliff or canyon, and all the action is taking place right there. Almost like the saloon is a character: a dilapidated, worn-out, antique from a bygone era that for reasons of sentimentality just has never been upgraded or burned down. My favorite one (I really hope I can find it somewhere) is titled, "Hang in there ol' buddy." 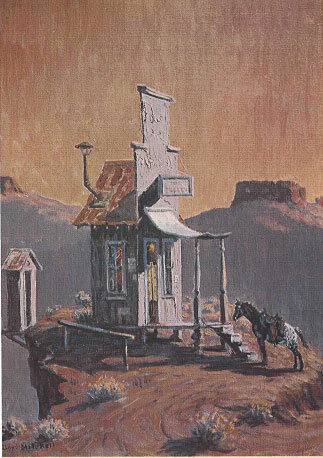 It depicts the skinny saloon on the edge of town which is coincidentally on the edge of a deep western canyon. A cowboy has roped a boney old steer which has caused a string of horrible mishaps: First, the rope gets bound to the saddle horn. Second, the cowboy has gone over the front of his horse but managed somehow to hold the reins. The horse has slipped off the edge and one of the saloon's patrons has tied the steer's tail in a knot around the porch support post of the saloon. The post is bent almost to breaking, the whole saloon is tipping off its foundation toward the canyon and from the side-view you see a cowboy grasping to his reins below his horse who is strapped to the saddle, hangin from a lariat which is looped around the steer's horns, who's tail is tied to the post of the skinny saloon! I hope my description gives this great picture justince. 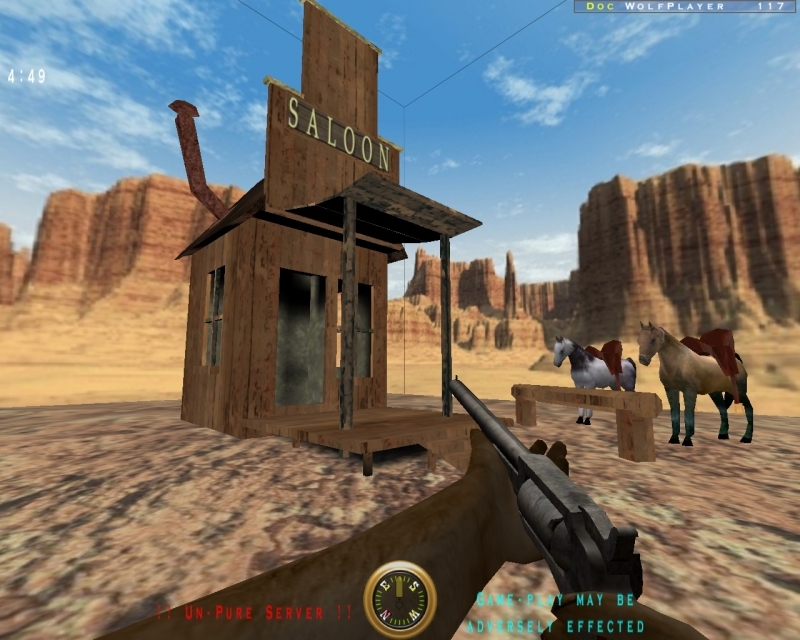 I think the king of the hill would be a great objective for a Skinny Saloon map. Folks say a church or maybe a courthouse or post-office oughta be the first building in a new town. That wasn't the case with Murderer's Dive. Way back when the first gold shipments started coming by train (from El Paso to Abelene? ), a now forgotten businessman opened up a quaint saloon near the "edge" of bandito country. The place has changed hands more times than a pair of rawhide gloves, but this time the owner is dead and the saloon is up for grabs! Territorial magistrate says the new ownership will be decided the western way... whoever can hold it the longest! Build a climbing rope to come up the back way. I think a dual capture the objective might work well too. Brrrr! It's so cold it takes a week to pour syrup on your flapjacks! It has been a tough winter and both the Cowboys and Bandits are running low on matches and kerosene to stay warm. Sick one's need medicine too. The Skinny Saloon has been boarded up for the winter and its owner has gone south till spring. That means survival depends on who can get the supplies first! Blow the door of the saloon and retrieve the matches, kerosene and medicine. Both teams have same obj's and first to get them all at once wins! I can see where moving to ET engine would open up some fun stuff, but could not these obj's be doable? Let me know if there is any way I can help out Zivs. Maybe a sign that reads "No spittin' on the floor. 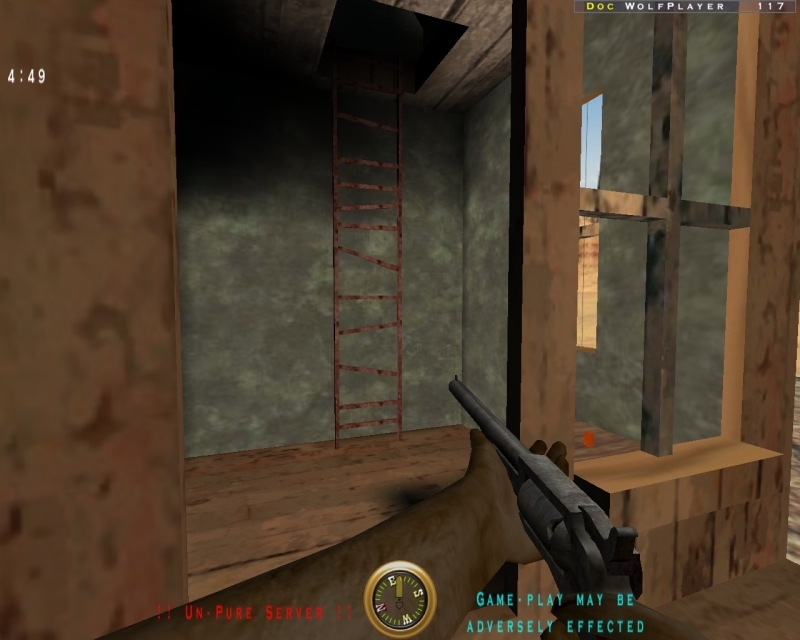 Use the cliff!" Make the back wall (behind bar or *piano* a 2d texture that looks like bottles on a shelf to save space? zivs wrote: and expanding the territory around it. Very interesting ideas there Zivs! I am loving the renewed interest in the mapping for the WW. It ads a lot of life into a great MOD...I only hope Hewster is watching from Cyprus with a big smile seeing his child grow!! This one story sounds interesting, but as far as I've browsed WW textures, there ain't no winter'ish ones, which means a) making my own (what I don't know how and I'm pretty sure the result would be really bad) or b) changing the story to something like early preparing for winter (which would mean capturing the Saloon for some time to win the map). Also I'm not sure if the supplies grabbing is really that easy objective, since I'm very dependent on Ringo's help (basically whole scripting) at this matter ... If I couldn't even script a simple doc run script, I'm pretty sure that without scripting masterminds help I couldn't do this one also. Anyhow, in the nearest future will think of way to make the cliff (or canyon). 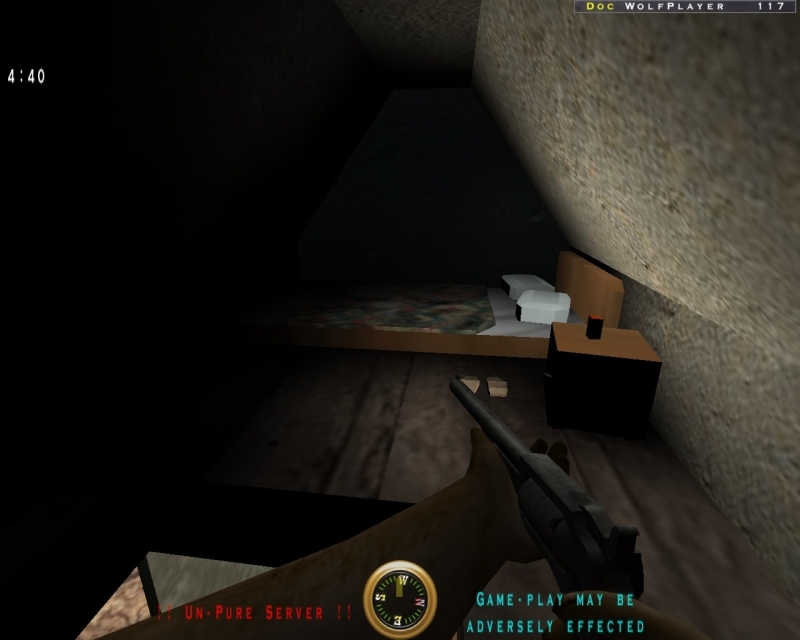 Then will try to expand the map for even meat'ish 6on6 possibilities or something like that. It seems to me the equal objectives approach makes sense for such a map (by that I mean both teams are doing the same thing - not the classic defend vs attack). Maybe they're both trying to capture the player piano! Anywho, I'm not much help on the creation side so I'll just be the critic, howz that? Well, that King of the Hill script (which hopefully Ringo will adapt to WW ) means that there would be attacking both teams. Ahhh, right. Well let's just say I was agreeing with you in a totally unusual way. 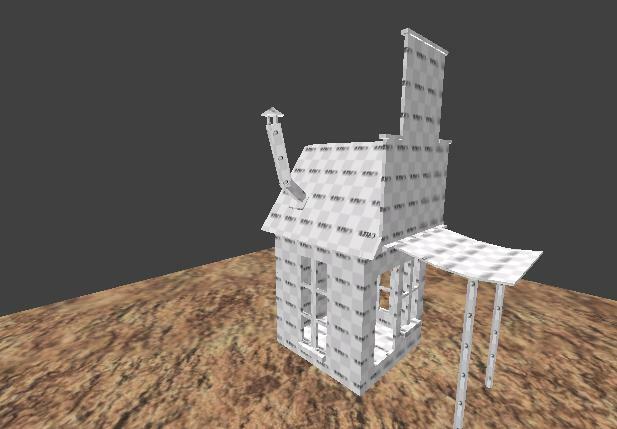 I feel funny saying this cause I'm sure there are plenty of you guys that are better at this than I, but although I'm no help with the story, scripting, etc, I might be able to do something on textures. (Having worked in 3D art.) So if you really want to try a winter setting for the map, I'm happy to help on the textures if I can. zivs wrote: Well, that King of the Hill script (which hopefully Ringo will adapt to WW ) means that there would be attacking both teams. ET map (pk3 ) u can borrow them from there ..
i believe someone coded something called .. santamod ..